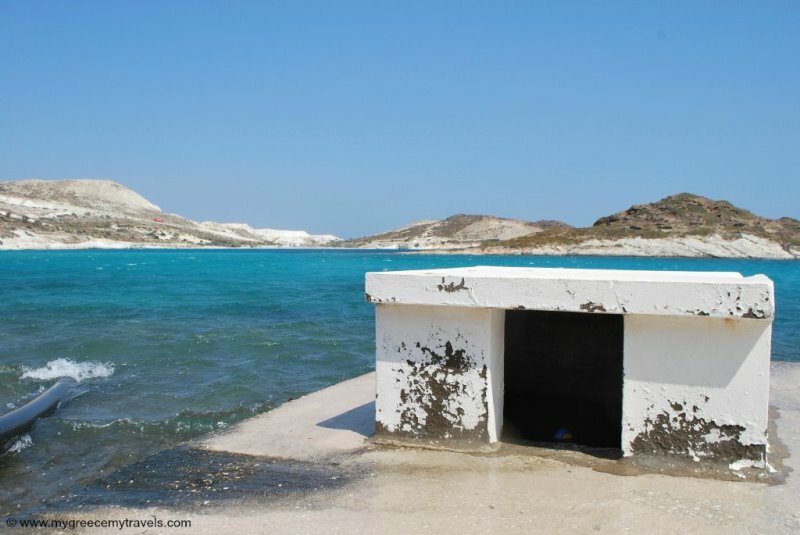 Kimolos is a chalk island. It produces it and that very fact contributes to its beach beauty, uniqueness and its name. 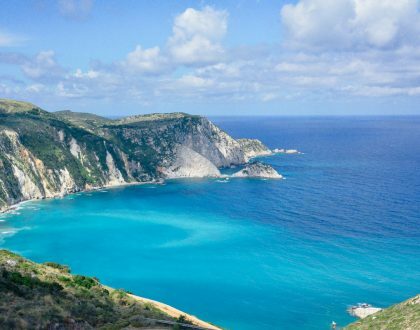 Kimolos takes its name from the Greek word kimolia which means chalk. I came up close all of that island chalk while I was poking around a manufacturing site. What was I doing there instead of a beach? Well, I had spotted it in the distance so I had to go and see it for myself. From far away I could tell it was place full of big trucks and machinery that seemed like they were sitting in some sort of winter wonderland — on a Greek island! The site was blanketed in white powder and seemed to be filled with hills of snow and piles of snowballs. The crew must have been out to lunch because it was deserted. No one was there to stop me from exploring the piles of white. As I was leaving, some workers showed up and didn’t seem to mind I had been poking around. 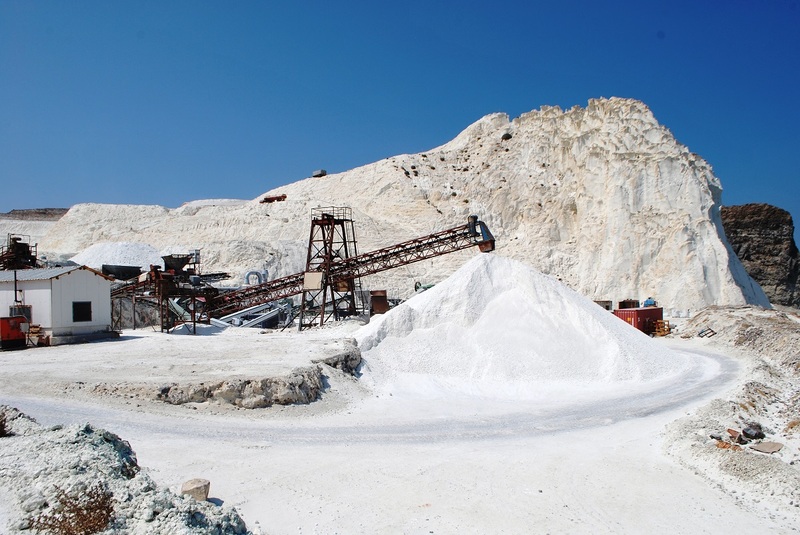 they ended up chatting with me about the various types of rock that was still extracted for industrial use including a white/silver quality of perlite, cimolite or chalk and bentonite. Betonite is clay generated frequently from the alteration of volcanic ash. 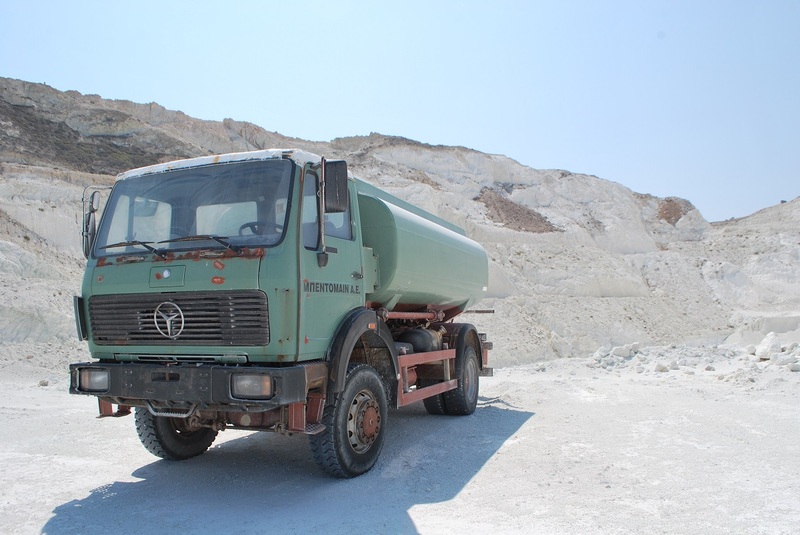 Chalk and a truck in Kimolos island. 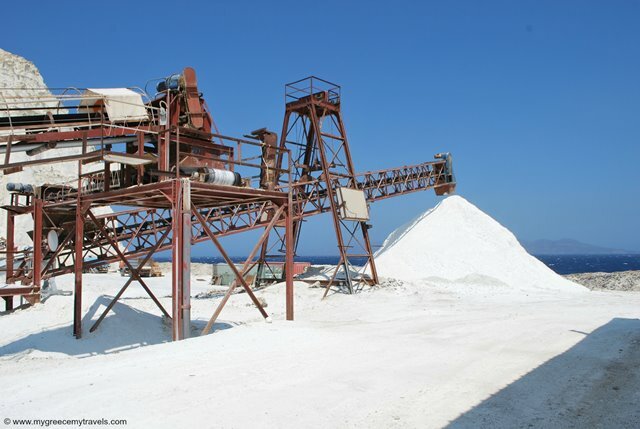 The chalk mining site was behind beautiful Prassa Beach which is known its fine white sand. 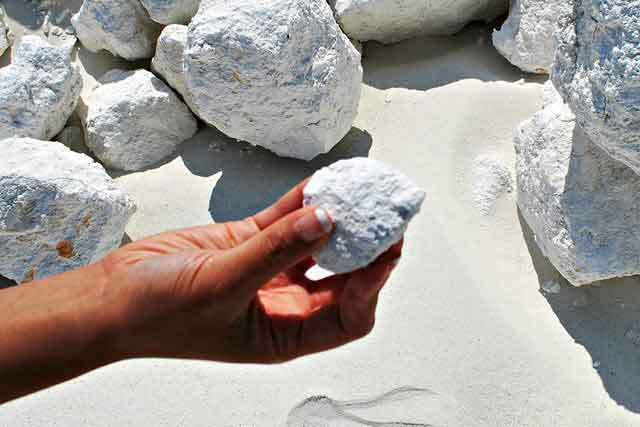 Turned out that sand derived from the white rock foundations of chalk that make up the island. Prassa beach. How gorgeous is this place? 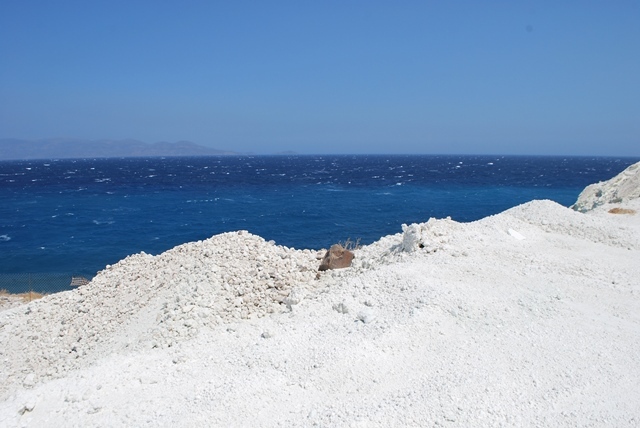 Kimolos lies in the outer part of the volcanic arc of the Aegean Sea. Besides its layers of colorful and rock, other traces of volcanic activity including its hot springs and strange rock formations contribute to the uniqueness of the island. Hot springs spring up on chalk island. 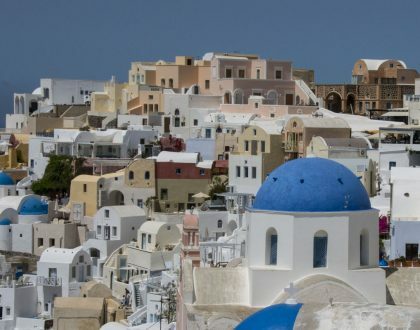 Ferries depart from the Athenian port of Piraeus and the surrounding islands of Kythnos, Milos, Paros, Serifos, Sifnos, Folegandros and Syros. 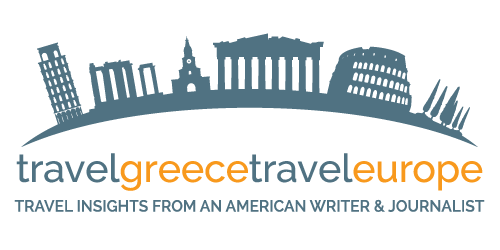 From Piraeus, ferry rides last from 4.5 hours to 7 hours depending on the type of ferry. For an updated ferry schedule visit www.openseas.gr. 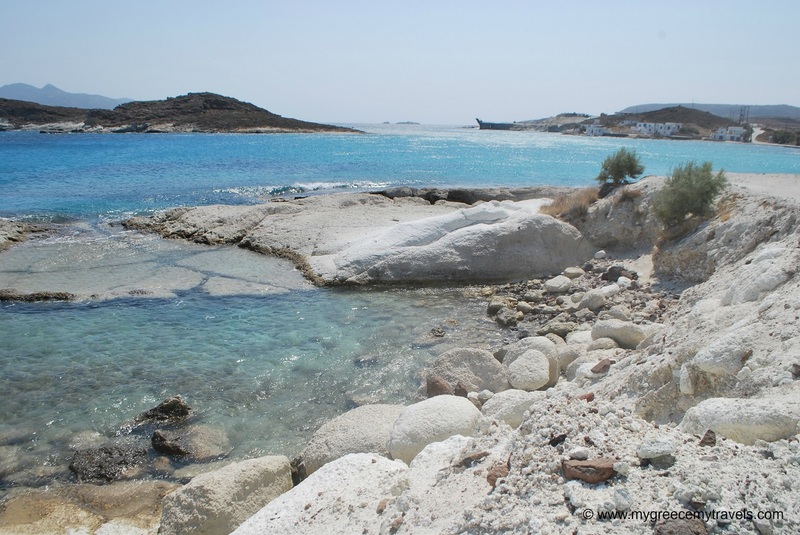 Psathi is the port of Kimolos and it is a 10-minute walk away from the islands main town called chora. 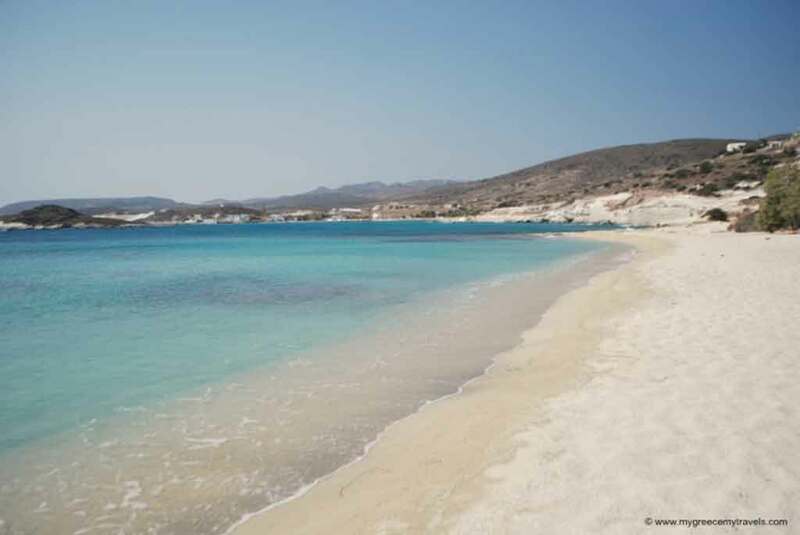 Check out my earlier posts on the best beaches of Kimolos, the fishing village of Goupa and the windmills of Kimolos. Have you ever been to Kimolos?